Nice. So far I have unfriended only one person. I suppose my threshold of tolerance his very very high, or should I say the threshold is low? Wow! 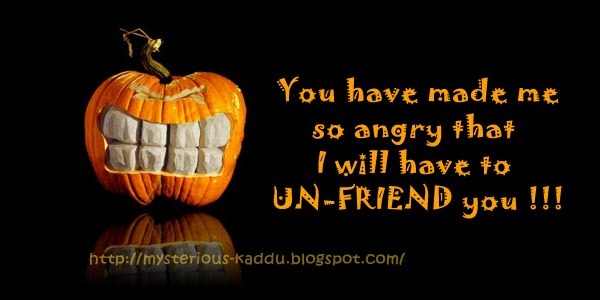 I have unfriended quite a few, but none due to anger. They were mostly inactive farmville players or spammy bloggers. 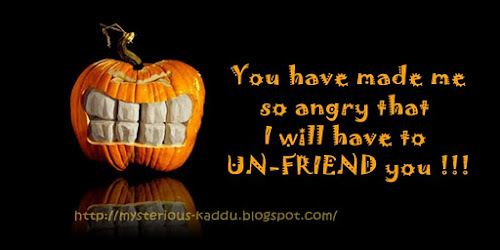 I usually wouldn't unfriend anyone unless if i don't like their attitude toward me. And so far i haven't come across anyone so, besides sifting through social networking sites is something i do once in a bluemoon. Hmmmm. I have very few ex-colleagues in my friend list. But then, since I'm not associated with the BPO sector any more now, it doesn't make any sense to network with those people, unless I was already on friendly terms with them when I left that sector. However, I don't see FB as the virtual space for my "friends"... I see it more as a place where I network with like-minded people. For friends, my house is the place to hang out (or theirs... doesn't make any difference)! Given the odd hours I keep however, Facebook helps me to stay in touch with people who do not live in Delhi any more or those who have a completely different schedule from mine, people I would have otherwise spoken over the phone with. I do not post status updates, do not play games, rarely post comments and almost never write on people's walls. Come to think of it, I might as well have stayed with email! Not to forget... you don't even have a display pic on Facebook! One can display ones picture on Facebook? Who would have thought. What would they come up with next? A button that you can click when you like something but are too lazy to comment on? Boy, wouldn't that be something.